CD reviews: "Singin' and Swingin'" and "Dreamscape"
These reviews first appeared in the June 13, 1998 edition of the American Reporter. Two recent releases by relatively unknown jazz vocalists show the tradition to be in fine shape. While there's always room for the top performers in any genre, the more important question is where the next crop will come from. And though these two singers are veterans, the fact that they can still gain a recording contract without name recognition would seem to hold out hope that the club scene is remains capable of providing the training necessary to produce top-flight singers. "Singin' and Swingin'" is Nancy Kelly's second release for the tiny Amherst label (small, but still solid  this is the same label that won a Grammy a decade ago for best big band album with Doc Severinson's old Tonight Show Band). Kelly has a smooth, slightly nasal voice quite reminiscent of Australian pop singer Helen Reddy. But if Reddy has stuck to the safely saccharine, Kelly has a nice grasp of the popular jazz canon: Cole Porter, Frank Loesser and Fats Waller all make appearances here through their compositions. Kelly has as solid a feel for delivery as she does for picking good songs. She's got a punchy style with some muscle to her singing. Backed by a solid series of session musicians (particularly nice solos by trumpeter Jeff Jarvis and pianist Rod Blumenau, with a rollicking intro on Waller's "The Joint is Jumpin'"), Kelly falters only when straying from jazz into vacuous pop like "Through the Fire" or "Come in From the Rain"  even Kelly seems to recognize such songs as a disgraceful waste of her beautiful voice. But to hear her caress a wonderful chestnut like "Stormy Weather" is to make the dross bearable. Besides, most CD players are programmable these days. 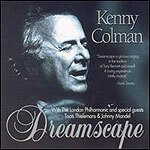 Kenny Colman has something on his latest CD that nobody else will have from here on out: An endorsement from Frank Sinatra. And like Kelly, he's possessed of a wonderful set of pipes. This reissue of a 1994 release has Colman  who knocked around nightclubs for years until a recommendation from Sinatra got him more steady employ  in front of a top-notch band with strings handling a dozen and a half torch songs of the highest caliber. Coleman shows a deft touch to the old style of jazz singing  at his best he is, as Sinatra points out, firmly in the tradition of Sinatra and Bennett. Also like Sinatra and Bennett, Colman has a very romantic style that will give him appeal to both jazz and easy listening fans  stick him out there with Dean Martin and Sammy Davis Jr. in his ability to meld artistry and romance. But as with Kelly, there are times Coleman shows a predilection for the schmaltzy, a willingness to lean more toward Steve Lawrence than Billy Eckstine. On balance, though, there are more highs here than lows  and few singers can burnish a song the way Colman can with that voice of his.